It would be superfluous to state that for nearly twenty years after the close of the war between the North and South that enterprise and progress were unknown quantities in the smaller towns of this section. The people were disheartened and had to adjust themselves to new conditions—conditions that were hard, and seemingly unbearable, for they were so different from those to which they had been accustomed. It was not until the year 1884 that there was a semblance of building of new stores or residences in Greensboro. The sound of the hammer and the saw had been unknown for nearly a quarter of a century. But in 1884, S. H. Lawrence built the little wooden store house on the south side of Main street now occupied by Wynne as a beef market. 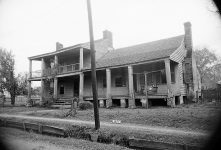 He soon afterward erected a cottage on the lot on which is now situated the handsome home of Thomas R. Ward, Jr. A few years prior to this, Col. L. J. Lawson built his present residence on Tuscaloosa street. 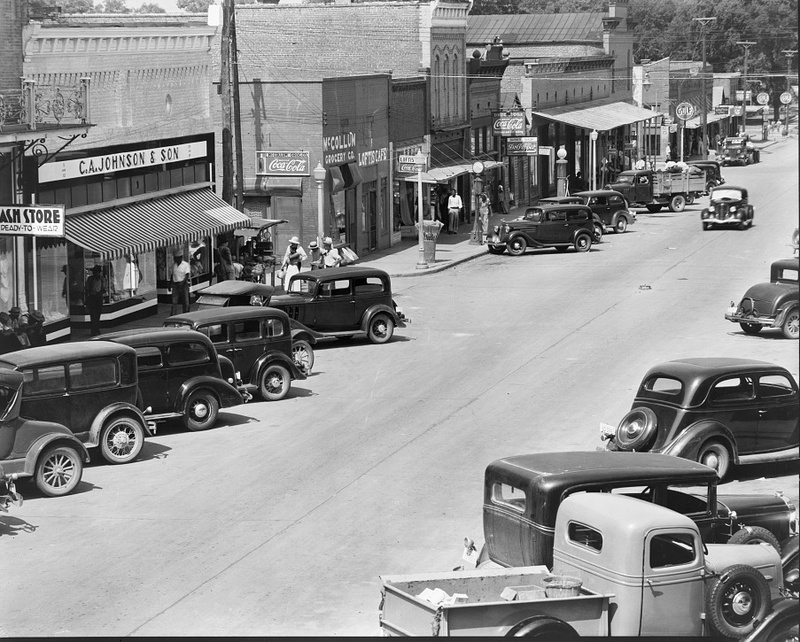 Other improvements began to be made, and Greensboro was progressing well until the “Birmingham boom” broke in full force upon the citizens, not only of Greensboro but of Hale County as well. Hundreds of thousands of dollars were carried there and invested—the buyers of real estate hoping to become immensely wealthy. 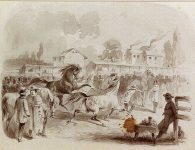 Some of them did well—many others did not, but lost heavily when the inevitable crash came, and prices of real estate shot downward, the winds of adversity seeming to blow untempered upon the “shorn lambs.” The large amount of money taken from Greensboro to Birmingham during 1886 and 1887 almost put a stop to the progress of the town in the matter of new buildings for several years. However, in 1887, Capt. S. T. Taylor moved to Greensboro from Mississippi, and purchased what was then known as the Scarff corner, at the intersection of Tuscaloosa and Main streets, and upon it he built the first brick store (possibly the one which W. W. Overstreet now owns (1908) and occupies being excepted) that had been built for forty years or more. J. S. Buchanan was the contractor at the price of $10,000. 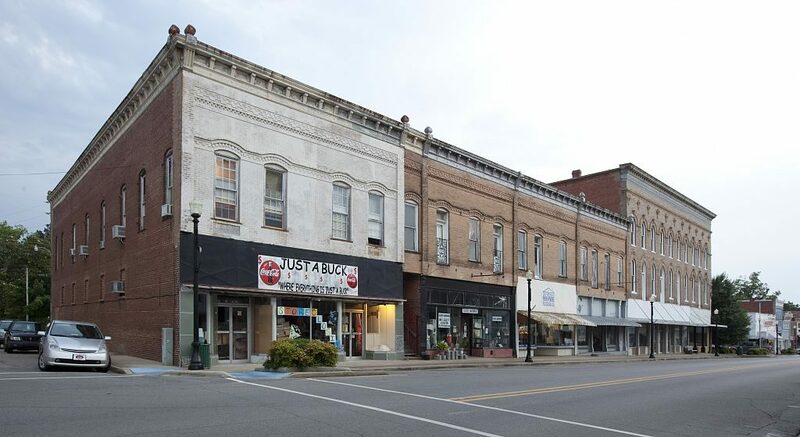 This only applies to the two story building on the corner—for the two stores immediately east of and adjoining this one were built by James W. McCrary in 1890. In 1891, T. R. Ward & Son removed the small wooden building on Main street which Dr. T. R. Ward had occupied as an office for many years and erected the present brick structure. The same year, G. W. Dugger added a story to the Greensboro Hotel. Morris Steinhart in 1894 tore away the wooden building in which J. W. McCrary did business for many years, and erected two brick stores and a brick warehouse on the site. 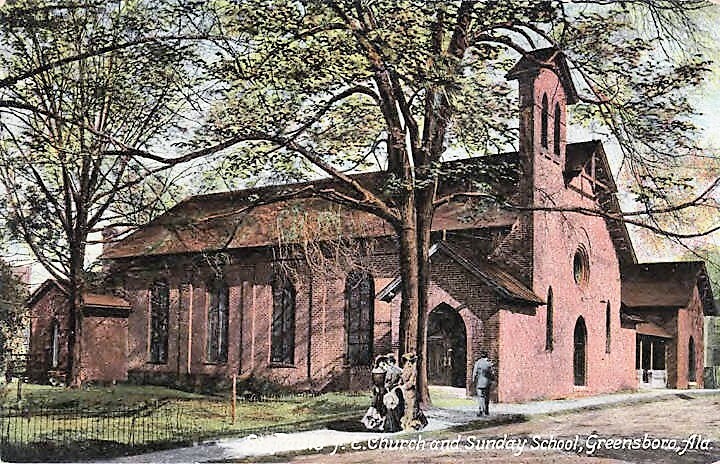 In 1895, the colored Baptists began the building of a large brick church on “Baptist Hill.” The work, while at present well under way, has by no means been completed. The same year, W. E. Torbert built his present brick livery stable. Dr. A. Lawson also remodeled his bank building. In 1897, J. A. Blunt erected a two story brick store now owned and occupied by P. F. Osborn. 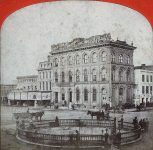 In December 1896, the building on Main street known as the old Christian Hotel, was destroyed by fire. It had been standing since about 1829 and was at one time regarded as among the finest two story bricks in the town. It was for a long while kept as a hotel by Mrs. Christian, a saintly woman, whose memory is yet kept alive by the older inhabitants. She was the mother of Judge W. C. Christian and of Mrs. L. W. Turpin, now of Greensboro. In 1898 Mrs. W. C. Tunstall, who owned the property, had the present one-story brick stores erected on the site of the old hotel building. In the old days, there formerly stood a brick building where the Johnson-Winn Millinery establishment now stands known as the “Mansion House,” which was kept as a hotel for a few years by the late Col. John G. Harvey. While it was under his charge, sometime about 1843, the building fell, wrecking nearly everything on the interior and killing a jeweler named Munn. 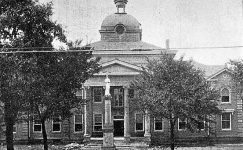 In 1898, Benners and Jack removed the small wooden structures on Main street formerly occupied as law offices and erected the two-story brick structure just east of Dr. Lawson’s property. The same year Ed. 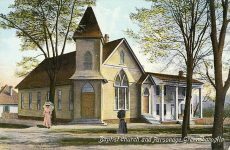 deGraffenreid built the two-story structure at present occupied by Gulley & Christian. 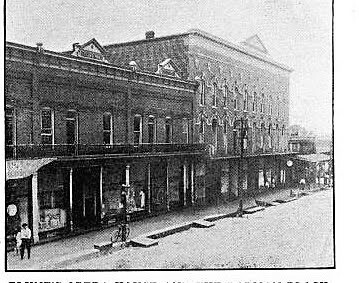 In 1899, Tutwiler & Jones removed the wooden buildings on the corner east of the Benners & Jack building and erected the two-story brick that stands there at present. In 1900, S. P. Stickney, who had purchased the L. Lawson property on Main street, removed the wooden structures standing thereon and erected the brick store occupied by F. F. Whittle, and also the one immediately east of it. This was the last wooden structure on the north side of the business portion of the town. 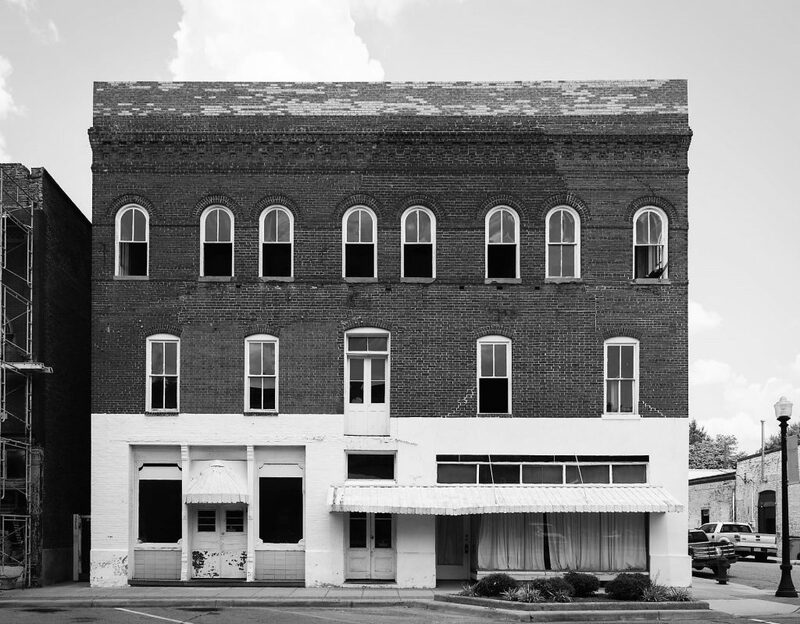 The passing of the old Lawson store recalled the memory of one of the noblest, sweetest-spirited Christian gentlemen that ever resided in the town—Lewis Lawson, the father of Dr. A. Lawson and Col. L. J. Lawson. He came to Greensboro from England, and for many years conducted a successful mercantile business here. In all good works, he was foremost and was true to every responsibility of life. Mr. Lawson died in Greensboro in December 1881, honored and respected by those among whom he had resided for so many years. It was through his kindness of heart that Greensboro was indebted for another most excellent citizen—Richard Andrews, also from England. 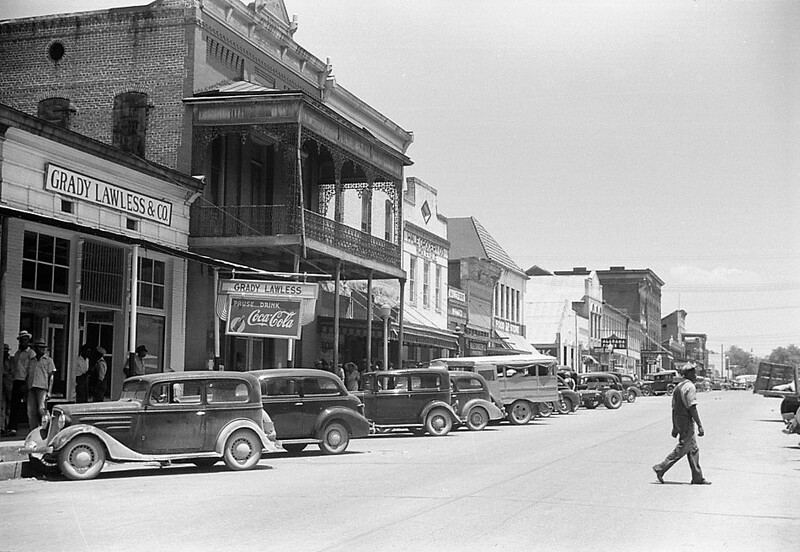 Mr. Lawson met Andrews, a wandering waif, in Mobile, and brought him to Greensboro and gave him employment in his store, where he remained until he was, in 1868, given the position as clerk of the Probate Court of Hale County, which position he filled with great credit until his death in January 1907. In the earlier days of his life, Mr. Andrews followed the Sea—being a sailor on a lumber ship that plied the Ocean. The wind never blew angrily that it did not recall to his mind his life as a sailor lad. There was one incident that was impressed indelibly upon his memory. While a severe storm was raging and the waves were running mountain-high, just as a sailor who was high up on one of the masts unloosing sails, uttered a frightful oath, a great gust of wind, more severe than any that had blown, swept him from the mast out into the angry waters. His body was never recovered. The thought of this poor fellow being ushered into eternity with that awful oath upon his lips always made this good man shudder. 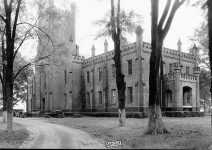 In 1902, Dr. S. C. Carson erected his Sanitarium and A. M. Tunstall built his law office. In 1902, John A. Straiton established his manufacturing plant in Greensboro, where it turned out numerous articles for building and furnishing houses. In 1904, M. D. L. Moore built the livery stable and three stores on the south side of Main street at the intersection of Tuscaloosa Street. 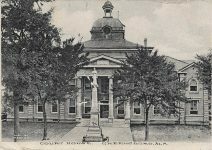 In 1906-7, J. A. 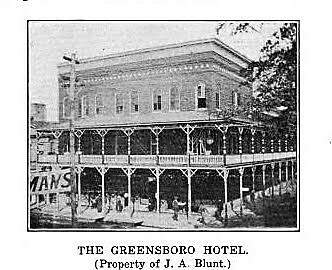 Blunt greatly improved the Greensboro hotel, and also, a few years previous to this time, erected the building now occupied as the Postoffice, and also the offices immediately to the south of this building, practically opening up a new business section of the town. The brick structures in Greensboro not mentioned as having been erected since the war have been standing so long that no present inhabitant remembers when they were built. A very large number of handsome residences have been erected during the past twenty years, and the town has steadily progressed. Greensboro is situated in the heart of a fine agricultural country, and while it may never become a very large city, it will always maintain a degree of prosperity proportionate to the success of those who cultivate the farms. 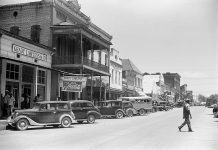 NOTE BY TRANSCRIBER: The Greensboro Hotel building is still in existence in Greensboro, Alabama and is in the historic district. ALABAMA FOOTPRINTS Immigrants: A Collection of Lost & Forgotten Stories When independence from Britain was won in 1776, a great westward movement of Americans began. Historians refer to this movement west as the Great Migration. Though it was only a territory, Alabama’s population grew faster than any other state in the United States during the time. They rode him on a rail down the main street of Greensboro, Alabama because he . . .
A London, England Insurance company owned a massive building in Montgomery, Alabama before 1870. We learned much from 4-H clubs? How active are they in schools today?